Showing items in category Maldive Islands, sorted by newest listed first. 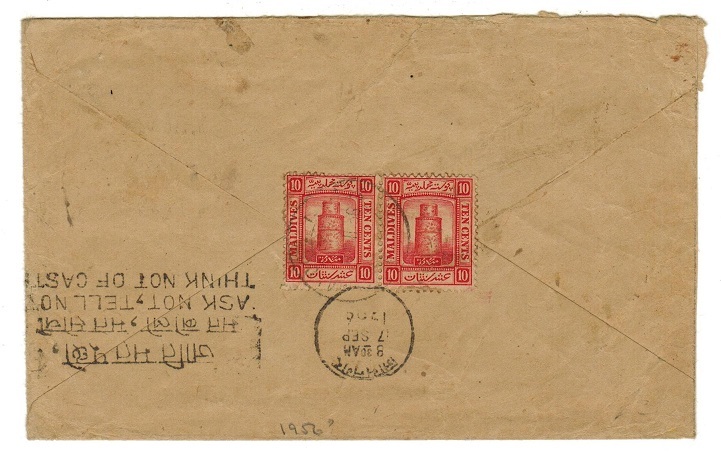 MALDIVE ISLANDS - 1944 8c rate censored cover to India. 1944 (5.XII.) 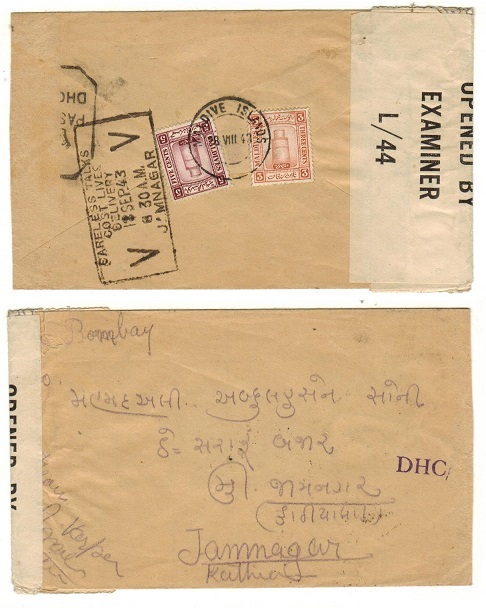 cover addressed to India bearing 3c and 5c adhesives on reverse flap cancelled by MALDIVE ISLANDS cds with black on white OPENED BY/EXAMINER/ L/30 censor label at right and with additional OPENED BY EXAMINER label applied on arrival tied by octagonal crowned PASSED / DHC/21 h/s. MALDIVE ISLANDS - 1942 8c rate censored cover to India used at MALDIVE ISLANDS. 1942 (28.VIII.) cover addressed to India bearing 3c and 5c adhesives tied to reverse flap by MALDIVE ISLANDS cds. Cream censor strip at left with local script applied which has then been over stuck by OPENED BY/EXAMINER/ L/44 censor label. Very scarce. MALDIVE ISLANDS - 1906 10c pink RPSE unused. H&G 1. 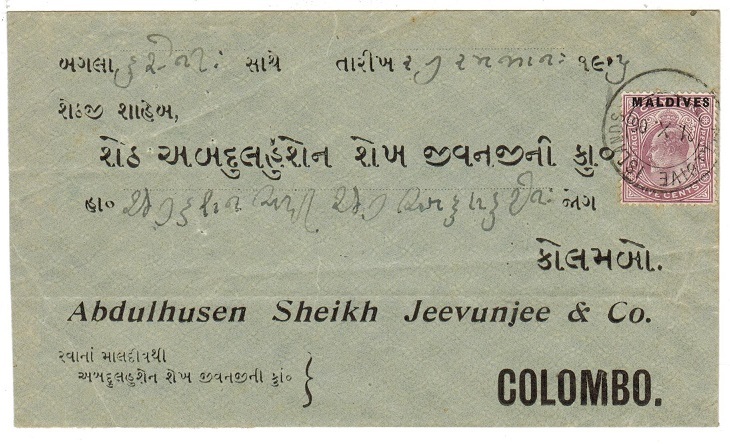 1906 10c pink on cream registered postal stationery envelope (size F) in unused condition. Light overall toned and the pink colour faded somewhat. A rare piece of stationery however. H&G 1. MALDIVE ISLANDS - 1957 20c rate cover to India used at MALDIVE ISLANDS. 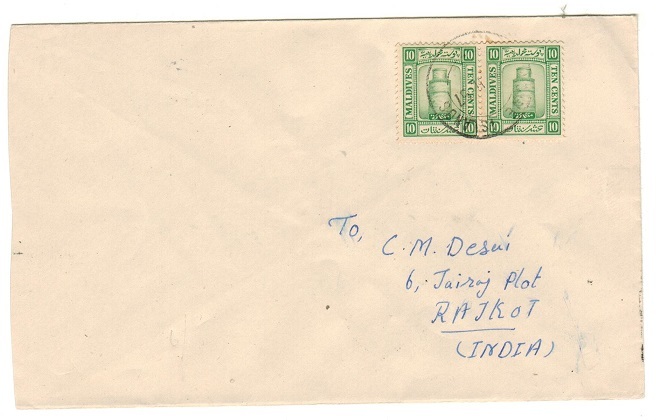 1957 cover addressed to India (Desai) bearing 10c green 'Mosque' adhesive pair tied by d/r MALDIVE ISLANDS cds. MALDIVE ISLANDS - 1955 20c rate cover to India used at MALDIVE ISLANDS. 1955 (21.X.) 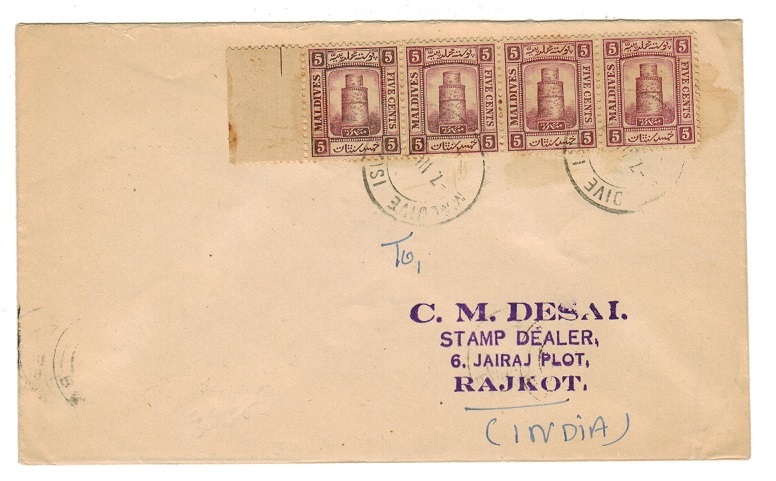 cover addressed to India bearing 10c carmine 'Mosque' adhesive pair on reverse flap tied by d/r MALDIVE ISLANDS cds. 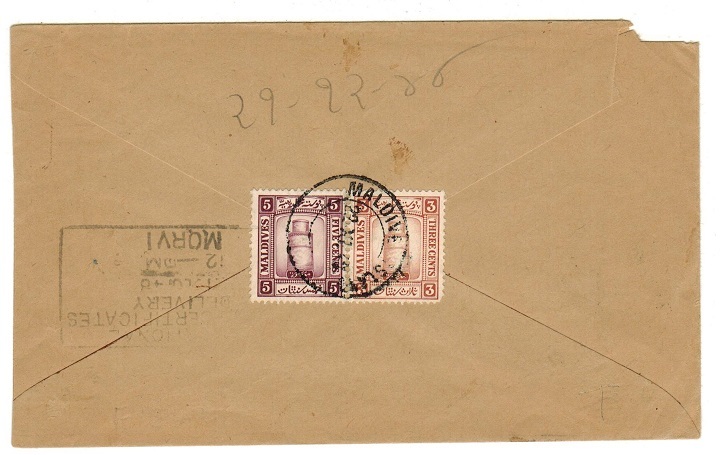 MALDIVE ISLANDS - 1948 8m rate cover to India. 1948 (22.XI.) cover addressed to Morvi in India bearing 3m and 5m adhesives tied by MALDIVE ISLANDS cds with boxed MORVI/NATIONAL CERTIFICATES arrival . MALDIVE ISLANDS - 1950 10m rate cover to UK. 1950 (23.V.) 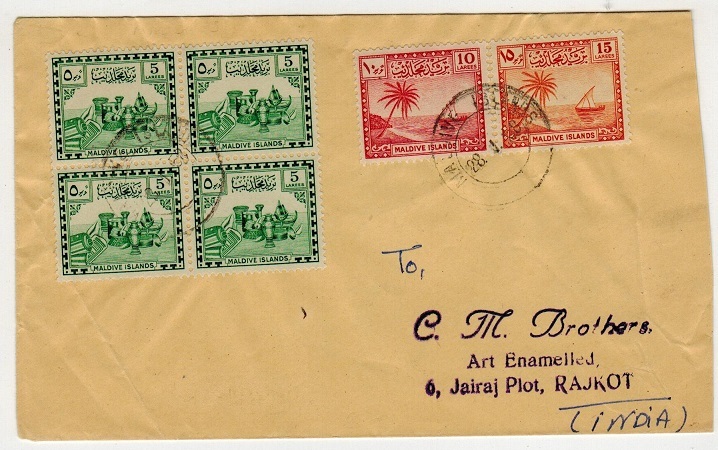 cover addressed to UK bearing 10m green pair tied MALDIVE ISLANDS. 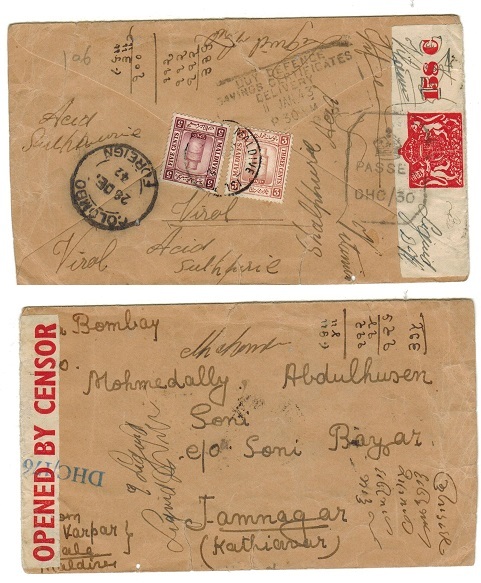 MALDIVE ISLANDS - 1942 8m rate censored cover to India. 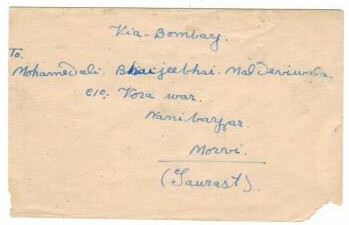 1942 cover addressed to India bearing 3m and 5m adhesives tied to the reverse flap by MALDIVE ISLANDS cds. Red on white 158C/OPENED BY CENSOR crested censor label applied on arrival. The cover with numerous manuscript notes added. MALDIVE ISLANDS - 1939 8m rate cover to Ceylon. 1939 (10.VII.) cover addressed to Ceylon bearing 2m and 6m adhesives tied on the reverse flap by MALDIVE ISLANDS cds. 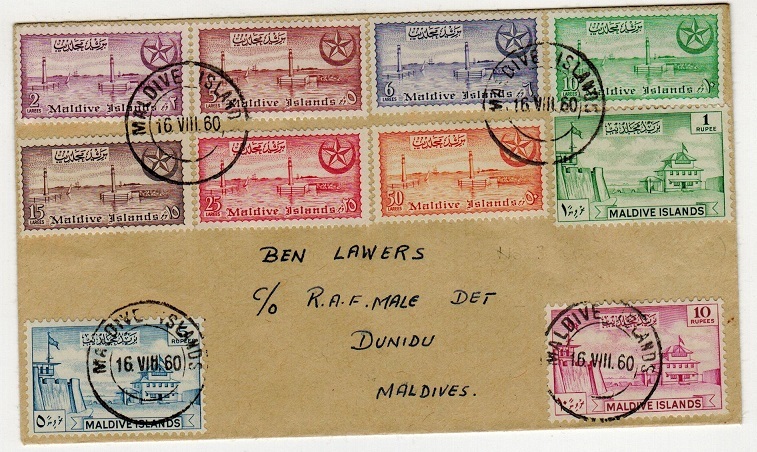 MALDIVE ISLANDS - 1960 cover bearing the 1956 series to RAF Station at Dunidu. 1960 (16.VIII.) local cover to Dunidu bearing the complete 1956 series (SG 32-42) excluding the 3l value tied by MALDIVE ISLANDS cds's. MALDIVE ISLANDS - 1968 multi franked cover to Ceylon. 1968 (28.1.) cover addressed to India bearing 5l (x4) and 10l and 15l adhesives tied by MALDIVE ISLANDS cds. MALDIVE ISLANDS - 1953 cover to Ceylon. 1953 (1.1.) 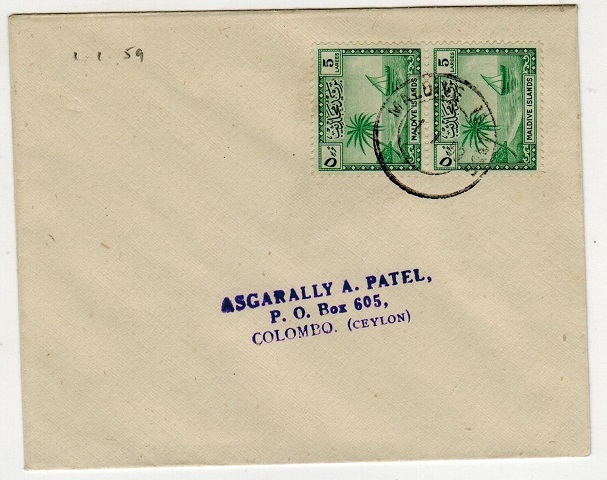 cover addressed to Ceylon bearing 5l emerald pair (SG 23) tied by MALDIVE ISLANDS cds. 1953 (1.1.) 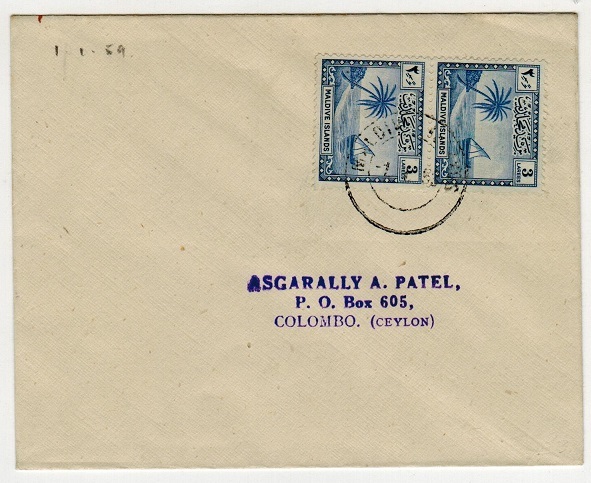 cover addressed to Ceylon bearing 3l blue pair (SG 24) tied by MALDIVE ISLANDS cds. MALDIVE ISLANDS - 1954 cover to Sweden with 1d deep blue tied MALDIVE ISLANDS. 1954 (23.V.) 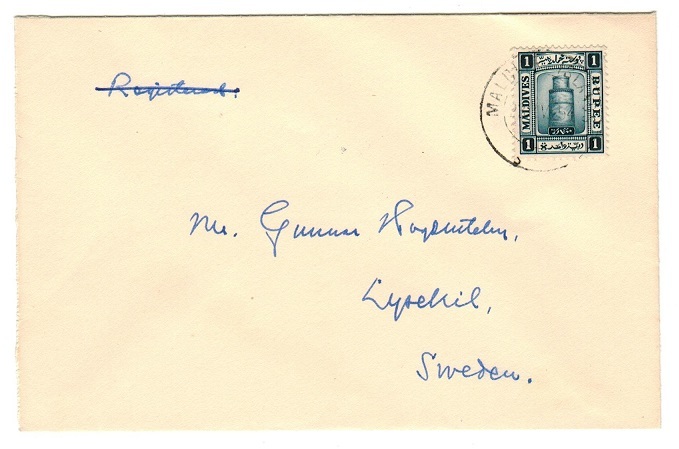 cover addressed to Sweden (scarce) bearing 1r deep blue adhesive tied by MALDIVE ISLAND d/r cds. 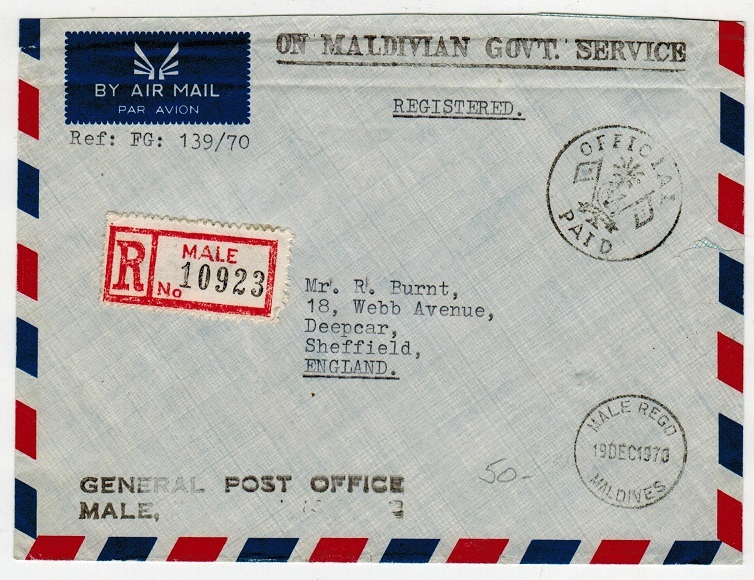 MALDIVE ISLANDS - 1970 OFFICIAL PAID registered stampless cover to UK. 1970 (DEC.19.) use of air mail envelope handstamped by black ON MALDIVIAN GOVT SERVICE handstamp addressed to UK cancelled by MALE REG/MALDIVES cancel and with both two lined GENERAL POST OFFICE/MALE h/s at left and circular (flag emblem) OFFICIAL/PAID h/s in black. Red on cream perforated R/MALE/No. label. COLOMBO REGISTERED/FOREIGN transit b/s. A scarce piece of modern postal history. 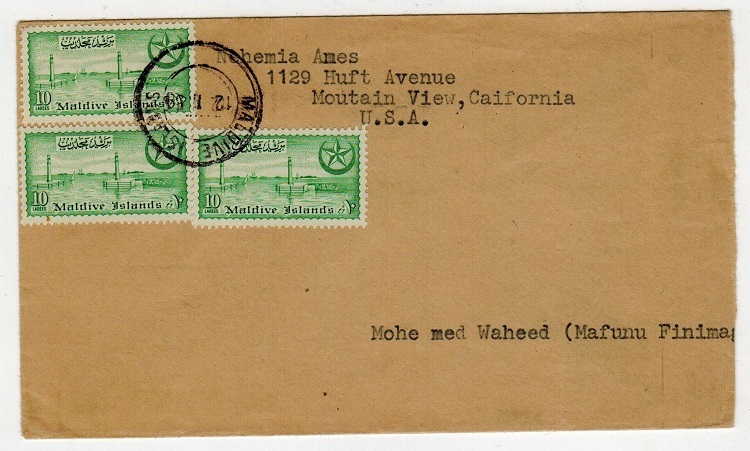 MALDIVE ISLANDS - 1959 cover to USA used at MALDIVE ISLANDS. 1959 (12.1.) 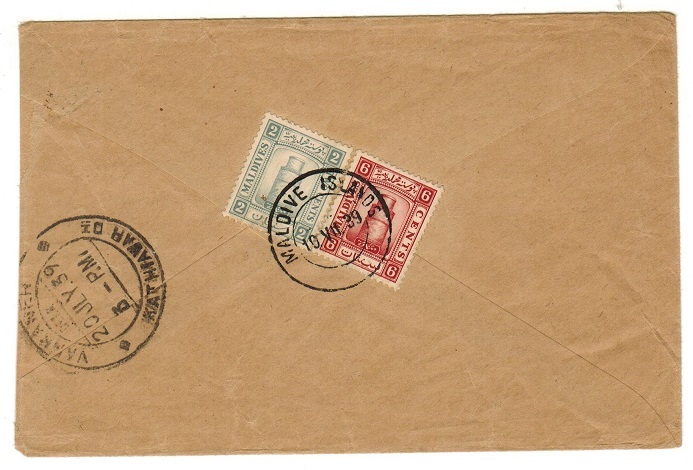 cover addressed to USA bearing three examples of the 10l adhesive (SG 36) tied by MALDIVE ISLANDS d/r cds. A nice genuine use of these stamps during the Sultanate period and uncommon. MALDIVE ISLANDS - 1953 official FREE envelope to UK with contents. 1953 (23.VI.) 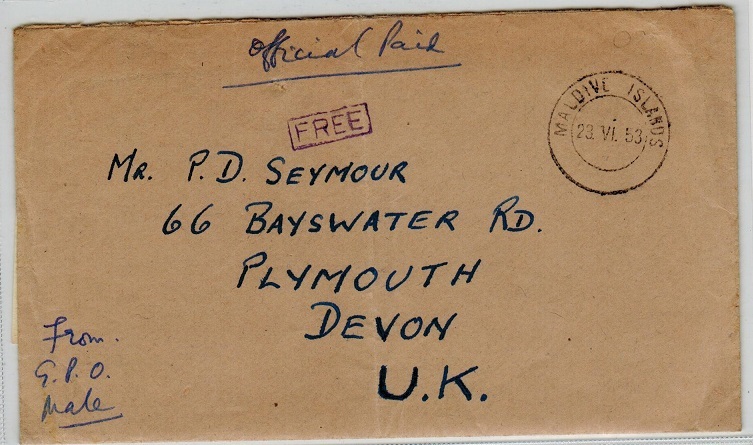 conventional sized manilla envelope addressed to UK marked 'Official Paid' and handstamped by violet boxed FREE strike with d/r MALDIVE ISLANDS cds alongside. Complete with original contents on headed 'General Post Office/Maldive Island' paper. MALDIVE ISLANDS - 1956 20m rate cover to India. 1956 (6.VII.) 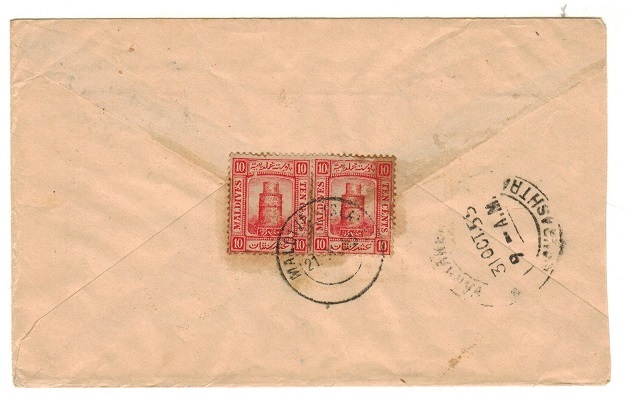 cover addressed to India bearing 10m carmine adhesive pair tied to reverse flap by MALDIVE ISLANDS cds. A very late use of these stamps. MALDIVE ISLANDS - 1957 20m rate cover to India. 1957 (7.III.) 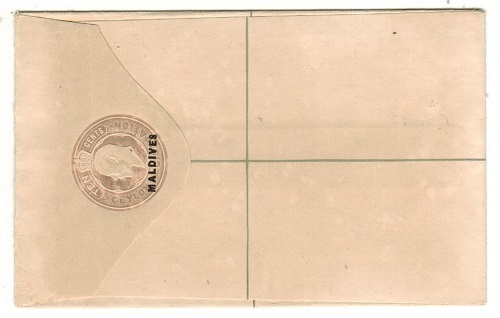 cover addressed to India bearing a marginal strip of four of the 5m mauve adhesive (SG 14A) tied by d/r MALDIVE ISLANDS cds's. RAJKOT arrival b/s. MALDIVE ISLANDS - 1950 10m rate cover to Ceylon. 1950 (4.VII.) cover addressed to Ceylon bearing 10m adhesive tied by somewhat smudged MALDIVE ISLANDS cds. MALDIVE ISLANDS - 1949 8m rate cover to India. 1948 (9.X.) cover lightly addressed to India bearing 2m and 6m adhesives tied to reverse flap by MALDIVE ISLANDS d/r cds with boxed CALCUTTA 6/DELIVERY arrival strike. 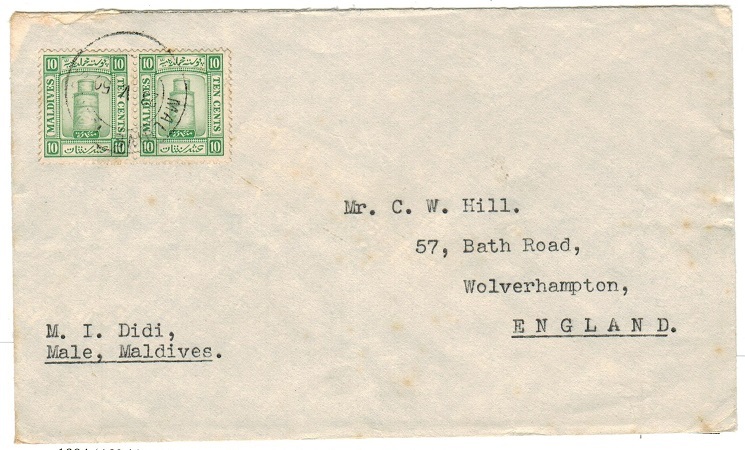 MALDIVE ISLANDS - 1952 OHMS envelope registered to UK handstamped FREE. 1952 (19.V.) long O.H.M.S. 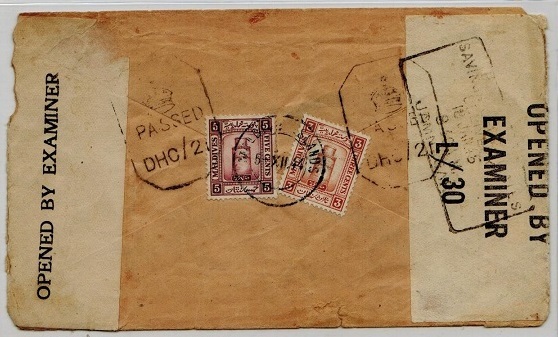 manila envelope registered to UK cancelled by d/r MALDIVE ISLANDS cds with scarce violet boxed FREE h/s applied (Proud type OPD1) and black boxed 'R' registered h/s (Proud type R1). The reverse has small red waxed GENERAL POST OFFICE seal applied. MALDIVE ISLANDS - 1906 cover to Ceylon with 5c adhesive tied MALDIVE ISLANDS. 1906 (21.X.) commercial cover addressed to Ceylon bearing the 5c lilac Ceylon adhesive overprinted MALDIVES and tied by d/r MALDIVE ISLANDS cds. COLOMBO arrival b/s. A scarce early cover. MALDIVE ISLANDS - 1933 series superbly used on individual pieces with MALDIVE ISLANDS cds's. 1933 series of nine each on small piece and tied by complete MALDIVE ISLANDS cds dated 17.XII.36. SG 11/20 (unknown watermarks). A lovely attractive series. MALDIVE ISLANDS - 1948 use of the 1933 re-drawn set on cover tied MALDIVE ISLANDS. 1948 (25.IV.) 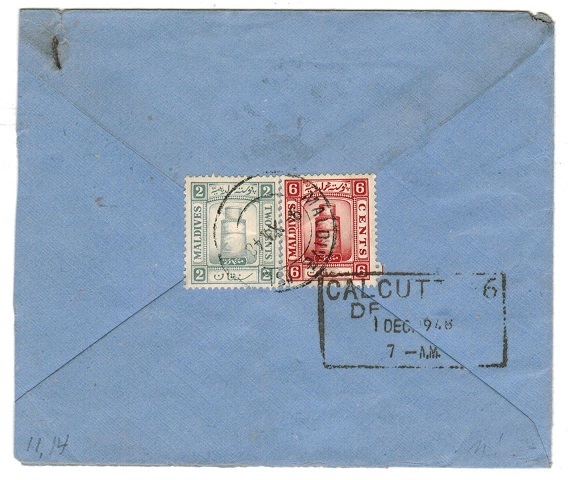 long manilla envelope bearing the complete series of 2c to 1r from the 1933 re-drawn set of nine tied by various MALDIVE ISLANDS d/r cds's. Philatelic but a scarce set complete on cover. 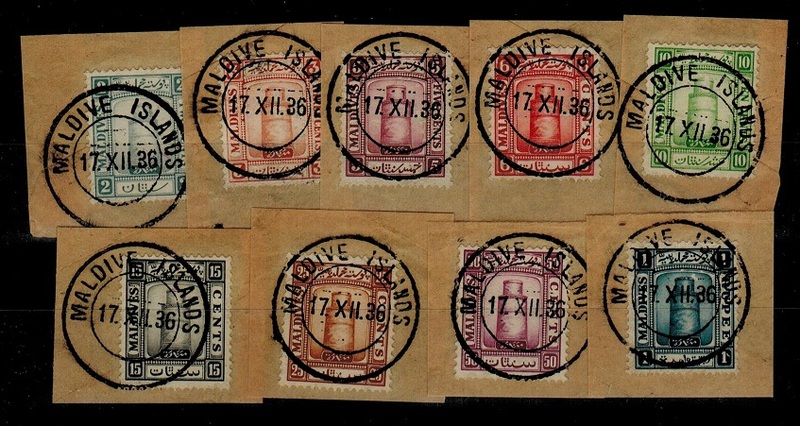 MALDIVE ISLANDS - 1936 use of 6c Ceylon adhesive cancelled MALDIVE ISLANDS. 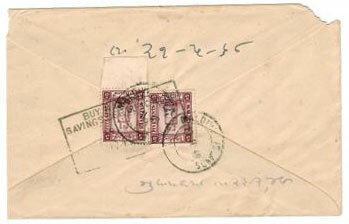 1936 6c pictorial adhesive (SG 370) cancelled by near complete d/r MALDIVE ISLAND cds dated 28.III.37. Ceylon stamps used in the Maldives are very elusive. MALDIVE ISLANDS - 1933 use of 6c Ceylon issue cancelled by complete MALDIVE ISLAND cds. 1933 (7.VII.) 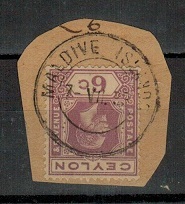 use of Ceylon 6c violet adhesive on piece and cancelled by complete d/r MALDIVE ISLANDS cds. Ceylon adhesives used in Maldives are rare. MALDIVE ISLANDS - 1950 10c rate cover. 1950 (10.III.) 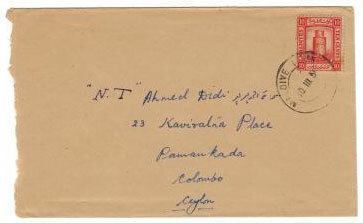 cover addressed to Ceylon bearing 10c adhesive tied by MALDIVE ISLANDS d/r cds. 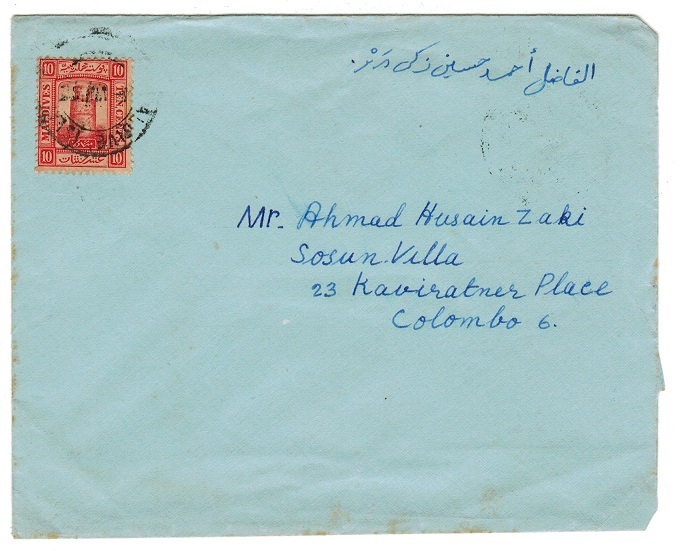 MALDIVE ISLANDS - 1949 5c (x2) rate cover. 1949 (16.11.) cover addressed to India bearing 5c (x2) tied to reverse flap by MALDIVE ISLANDS d/r cds with SAVINGS CERTIFICATE slogan h/s applied in transit. Scarcer stamps used on cover. 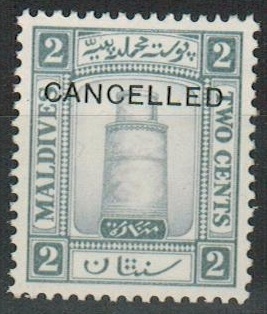 MALDIVE ISLANDS - 1933 2c adhesive overprinted CANCELLED. 1933 2c Grey in fine unmounted mint condition overprinted CANCELLED. Marcus Samuel stated that these overprints were Harrison samples submitted to the Maldive authorities. Scarce.